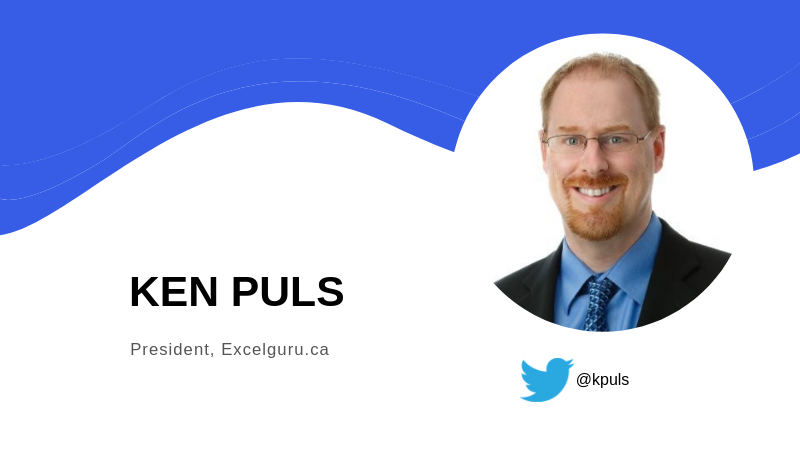 Ken Puls is an Excel guru. His blog offers downloadable courses, free utilities and help forums and live training. An accountant by trade, Puls helps clients with Power Query training and other basic, intermediate and advanced Excel skills. Puls spoke with us recently about why Excel is so ubiquitous and what it feels like to be a software rock star. Can you share a bit about how you came to become an Excel expert? I’m an accountant, and Excel is the most-used tool in the finance industry. I started with spreadsheets when I was a kid. Excel works really well for the structured world where we’re looking at reconciling transactions and trying to figure out how profitable we are. I got hooked on Excel around 2003. My organization ended up having a big staff cut. At the time, I was experimenting with VBA, the macro language inside Excel. I told my boss the only way we were going to get through [the layoffs] was to embrace automation. Within the next year, I had taught myself how to program in VBA and I basically automated every single one of the positions that we had to cut. That’s where I really got a passion for making this software work for me. Why do you think Excel has become so popular? Excel is kind of the Swiss army knife of software. It acts as a database, as a calculator, as a report writer; it’s a very versatile tool. The beauty of Excel is that it can work with unstructured data or with structured data. Excel is everywhere, right? You walk into an organization and it’s on your desktop whether you’ve ever used it before or not. Everybody expects that when you sit down, you’re going to know how to create a spreadsheet. The first thing you see is people trying to track their grocery lists. As you start to evolve, you have finance spreadsheets and a budgeting forecast tool. One financial model I built ended up turning the profitability of a company because they’d overcommitted and were about to lose a couple of million dollars. We ran through the entire scenario and were able to take the company to a position where it was profitable by $2 million. It became a dynamic decision support model. That’s the power of Excel. It can go from grocery lists to full-on business models. No matter how big the company is, no matter how many billions of dollars they’ve spent on customized software solutions, the biggest financial decisions always come back to an Excel spreadsheet. What are the transformational features Microsoft has added recently? I think there are three. Power Pivot was the first to be released, and it was the best thing to happen to Excel in 20 years. A few years later, they brought out Power Query, and it is the best thing that happened to Excel in 30 years. There’s one more piece that I think is huge and it’s the way that they brought AI into Excel. One feature is Ideas. You can actually point to a dataset that’s in a tabular format, and Excel sends the structure of the data out to Microsoft’s AI platform. It comes back with different ideas for pivot tables or pivot charts. Can you talk about Microsoft’s business model for Excel? I will not recommend to any of my clients that they ever buy a four-digit version of Office ever again. We’ve got 2016 and 2019, which just came out. What you really want is Office 365 [Microsoft’s subscription-based, cloud-version of Office]. The reality with the subscription side is that I’m getting all the bugs fixes and new features delivered to my Excel every month. We teach everyone from people who’ve never used Excel to intermediate- to advanced-level training for accountants and analysts. We can teach anyone. The reality is that nobody gets any proper training, whether it’s from a professional organization or from their own company. When your coworker looks over the cubicle wall and sees you do something that they don’t know how to do, they ask, ‘How did you do that?’ We build this incredible confidence in people doing things slowly, manually and repetitively. I get lots of calls from people who say they want advanced Excel training for their users. We ask them about five questions and know we need to go to basic to intermediate work. This is one of those software apps where the degree of confidence actually outranks the skill level. You provide an incredible amount of information. What’s behind your business model? My business grew organically out of the fact that I love to share with people. I love exploring new technology. There is nothing that gets me more excited than when I get to stand in front of a room of people and I show them something. I watch their jaws drop and they say, ‘Oh my God, that would’ve saved me eight hours yesterday.’ There’s nothing that an accounting geek can do that comes as close to being a rock star. My favorite way to teach people is in person where I can actually see their eyes because that way I can tell when things go sideways. There are several reasons we offer both. Number one is price point. It costs a lot more to get an instructor into your office because there’s travel, the fee and all the rest of it. Online courses give you the ability to rewind, play it at a higher or speed and watch it multiple times. We offer multiple different styles of these things because there are multiple different learning styles. What’s on your Excel wish list? I’m really looking forward to seeing the branch of artificial intelligence expand inside Excel, whether it’d be features like Ideas or other features that we haven’t thought of yet. I’m really excited about more investment inside the Power Query toolset allowing us to rapidly automate data cleanup. Excelchat offers expert help with simple and complex Excel problems, delivered in seconds. To learn more about Excelchat, contact us today.